Lemmy Gets a new bass. 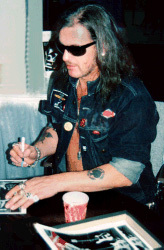 ... this man being none other than the one and only "Lemmy" of Motorhead fame or infamy depending upon one's particular point of view. Lemmy paid the RIC booth a visit during July's British Music Fair and caused quite a stir showing off his new RIC 4003S bass. It seems after many years of long and faithful service he finally retired his venerable and well used yellow RIC 4003 in favor of a 4003S, in the much more subtle Mapleglo color. Bass sales continue their resurgence, perhaps reflecting a return to traditional designs and conventional materials tempered by American craftsmanship. This is the bass guitar that continues to predominate among the most demanding of bassists. . . Lemmy included.